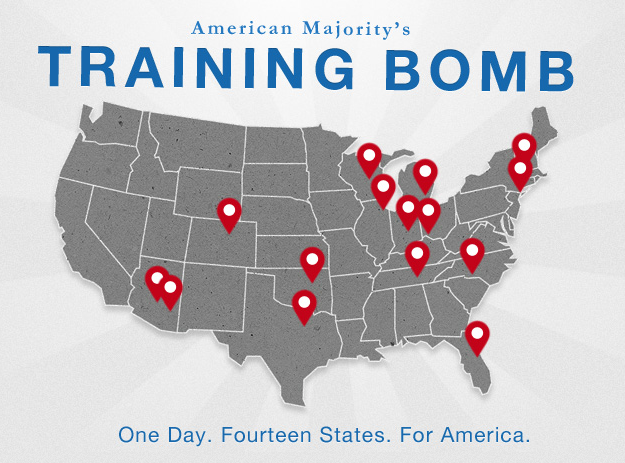 American Majority is holding a Training Bomb tomorrow at locations across the country, designed to educate and train conservative political activists. Not only will it be the biggest one-day training of conservative activists ever, but American Majority is going to be introducing new lectures, new manuals, and new projects. On September 17th, we will celebrate the 224th anniversary of the signing of our Constitution. It is one of the greatest political documents in history. But in 2011, the principles of limited government and individual freedom are in question. Understanding there is a problem is not enough. Coming up with ideas to solve the problems is not enough. Protesting is not enough. For us to turn this country around, the citizens must be equipped with the tools to bring about real change, and then spurred into action. We know we need to reduce the impact of government on our lives in order to make America stronger, and there’s no better day than Constitution Day to bring thousands of Americans together to learn how they can ensure we continue to live in a free society. Get trained. Make a difference. To that end, American Majority, one of the premier political training institutions in this country, is proud to announce that on September 17th, Constitution Day, it will be conducing the first ever Training Bomb. Tea Party members and liberty minded activists will come together in more than thirteen cities for the largest single-day grassroots training initiative in American history. For the first time, simultaneous sessions across America will be held to educate and mobilize fiscally conservative activists and future leaders. This is not a rally. This is not a summit. This is a massive effort to equip concerned citizens with the tools necessary to bring about change. Both an activist and candidate curriculum will be offered at each location to help the conservative cause organize for victory next year. With the 2012 election season just around the corner, American Majority Oklahoma is inviting patriots to get a jump on the competition in preparation for one of the most important elections in recent memory. On Saturday, September 17th, American Majority Oklahoma will be in the Tulsa metro to present “Kickoff to Election 2012”. The “Kickoff to Election 2012” will take place from 11:00 AM to 3:00 PM and will be held at the Lord of Life Lutheran Church located at 12802 S Memorial Drive in Bixby. The cost is $25 per person, and lunch and all training materials will be provided. Seating is limited and pre-registration is strongly encouraged. This training, which is a part of American Majority’s Constitution Day Training Bomb, is designed for potential candidates, activists, volunteers, and any concerned citizen who wants to make a difference in the 2012 elections. THIS BRAND NEW, NEVER BEFORE SEEN PRESENTATION will focus on simple and applicable keys to victory that conservatives can use to prevail in politics and transform our nation. For more information or to register, please visit www.trainingbomb.com. You can also go here for more information. American Majority is a fantastic organization, and I can't recommend them and their events enough. This coming election cycle will be crucial to America's future, and it is vital that conservative activists have the training necessary to be effective. If you can attend, I encourage you to do so.